Fast forward to June 2018, and Brienne is now 30 weeks pregnant with her second baby. 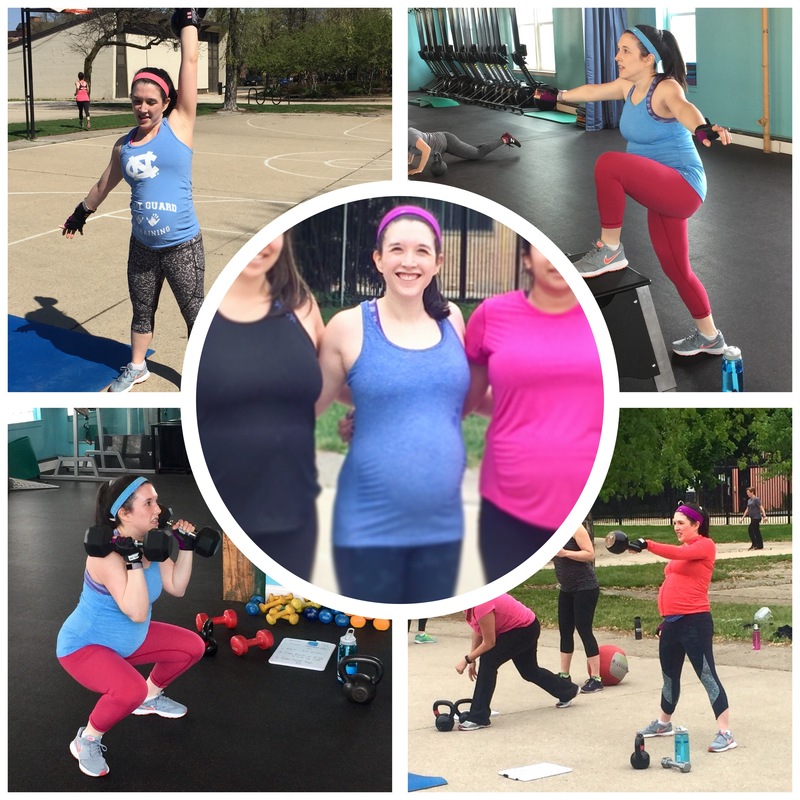 Her prenatal fitness journey is an impressive one—she is even in awe with what she has accomplished physically during this pregnancy. 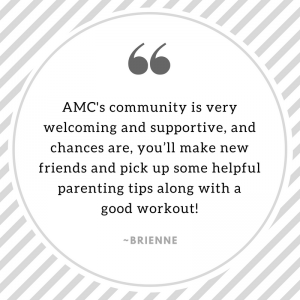 For the last two+ years Brienne has been consistently training twice a week in AMC’s Fit & Fab Small Group Training sessions. When she found out she was pregnant in January, she confided in me—as I ask all clients to do, even if it’s not public knowledge. We didn’t change anything in her workout regimen. She was self-regulating her effort based on nausea and/or fatigue. And you know how that goes during the first (or second, or third) trimester—which makes her consistency to stay active a feat in itself. “I’m feeling pretty good overall. I’m definitely feeling tired (which is probably unavoidable with a two-year-old at home and a career as a partner in a large law firm) and am starting to experience some of the typical aches and pains of the third trimester, but I’m still fairly active and haven’t really found myself needing to restrict any of my normal activities. At 30 weeks pregnant, Brienne is currently having some pelvic discomfort in the mornings (which she was told was common in second pregnancy). While this pain is not present during evening workout sessions, I have begun to modify her exercises accordingly. Do you feel strength training has benefited you during this pregnancy? Absolutely! For one thing, it has helped me keep up with the physical demands of caring for my preschooler, and the importance of that really can’t be overstated! It also has been an important source of mental strength. I spent my first pregnancy worrying about whether my physical activities could be hurting the baby, and limiting myself accordingly. 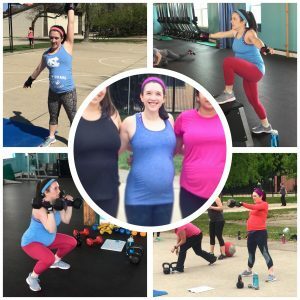 This time around, AMC workouts have helped give me a much better understanding of and confidence in what my pregnant body is capable of doing, and I’m hopeful that they also are laying the foundation for an easier labor and delivery/postpartum experience (I will have to report back on that one!). Have you been doing any other workouts outside of AMC’s training? 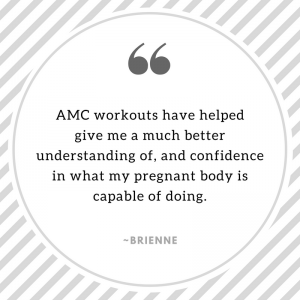 The question remains…will Brienne move over to AMC’s Prenatal Fitness Program like most Fit & Fab moms choose to do around their third trimester, or will she stay in Fit & Fab? This question is asked often by pregnant Fit & Fab clients. It depends on the client. It’s not necessary to move to prenatal training unless the client feels more comfortable. Regardless of program, every mom’s training is personalized to meet her fitness level. Yes, Brienne has had some modifications to some exercises (and exercises will continue to be modified based on how she’s feeling) — our focus is on maintaining strength at this point. So regardless if she participates with the prenatal clients or postnatal clients, her workout will be fitting to her fitness level and preparing her body for the demands of labor and delivery come August. Besides, she gives the postnatal mamas a bit of inspiration during training. “If the pregnant mama can do it, I can certainly try”. What are your personal fitness goals? Rather than wish for change, take action! No exercise experience is required to start our Fit & Fab training program or our Prenatal fitness progam. Let the power of small group training move you! Join us for a one-time test-drive for just $25. Experience a session for yourself and you too will be on your way to feeling more confident about what your (prenatal or postnatal) body can do!